﻿﻿﻿﻿The now-extinct Caribbean monk seal used to visit the Texas coast. When Christopher Columbus made his second voyage to the New World in 1494, he discovered a tropical mammal, the Caribbean monk seal, and ordered eight of the animals he called “sea wolves” killed for meat. It was pretty much downhill for the species after that. The Caribbean monk seal, the only seal native to the Gulf of Mexico, was declared extinct in 2008 after 50 years of no confirmed sightings. It is survived by its critically endangered cousins, the Hawaiian monk seal and Mediterranean monk seal, both also warm-water seals. Caribbean monk seals (Monachus tropicalis) used to be found in the tropical waters of the Caribbean Sea and Gulf of Mexico. They numbered in the hundreds of thousands and were most populous in places such as the Yucatán and the Bahamas. They were most likely Texas visitors but not permanent residents. In his book, Schmidly notes that in a 1905 survey of Texas mammals, only the bison, elk and Caribbean monk seal had disappeared from the state by the end of the 19th century. During the 20th century, they were joined by the gray wolf, red wolf, grizzly bear, black-footed ferret, jaguar, margay, bighorn sheep and manatee in the list of species gone from Texas. Marine scientist Gordon Gunter has suggested that single Caribbean monk seals and small herds occasionally visited Texas waters as far north as Galveston and as late as 1932, though those sightings have been questioned. Archeological evidence of the seal has been recovered at two Texas sites. Gunter documented possible seal sightings by observers in 1932 near Galveston and in 1926 and 1932 in the Lower Laguna Madre. Ship crewmembers who saw the Laguna Madre seal in 1932 called it a “land porpoise,” thinking it couldn’t be a seal since seals generally live in colder waters. Gunter figured that since the Caribbean monk seal was the only seal known to inhabit the Gulf, the observers must have seen monk seals. Others have suggested that the animals were actually California sea lions. The last confirmed U.S. sighting of a Caribbean monk seal occurred in Florida in 1922, and the last confirmed Caribbean monk seal sighting anywhere was made in 1952 at a seal colony between the Yucatán and Jamaica. Texas archeological evidence offers tantalizing clues about the seal’s history. A monk seal tooth was found at a site along the Nueces River about 20 miles from the coast. The site was the headquarters of a Spanish ranch, and a campsite at the ranch was believed to have been used by Native Americans. Five monk seal teeth were found at Mission Espíritu Santo, a Spanish mission established in the 1700s at what is now Goliad State Park. Gerald Raun, writing in the Bulletin of the Texas Archeological Society, says the Texas teeth were probably trade items and do not prove the existence of seals on the Texas coast. He says that both finds probably date to Spanish settlement of the area. 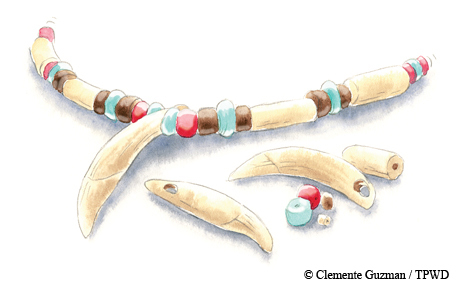 The teeth in both cases were canine teeth (in mammals, the sharp teeth used for tearing food), and those kinds of teeth were used as ornaments by Native Americans. Kyle Baker, a fisheries biologist who is on the endangered species team at the National Oceanic and Atmospheric Administration, says Caribbean monk seals probably foraged along the Texas coast but didn’t breed there. Southern Texas would have been the northern limit of their range. “Historically, they were in Texas,” he says. Not much is known about the natural history of the seal. The seals inhabited islets and atolls where fish were plentiful, and they “hauled out” in large social groups on sandy island beaches. They were known to occasionally visit mainland beaches. From the 1500s to the 1900s they were relentlessly slaughtered by fishermen, buccaneers and seal hunters for their hides, meat and oil. The seals showed little fear of humans, and their hauling-out behavior and tame nature allowed hunters to approach them. Their oil was used for lubrication of machinery and caulking of boats as well as fuel for lamps. As Europeans spread through the Caribbean, they disturbed seal habitat and disrupted seal behavior. By the mid-1800s, many biologists thought the seal was already extinct and referred to it as an “almost mythical” species. In the early 1900s, as the species was dwindling and sightings of the rare seals were reported, expeditions rushed out to collect the animals for zoos and scientific study, including a 1911 expedition that killed 200 seals. That didn’t help matters. The seal was listed as endangered under 1967’s Endangered Species Preservation Act, a precursor to the Endangered Species Act. By then, though, the seal was most likely gone. Extensive surveys conducted in the 1970s and 1980s found no definitive proof of the seal’s continued existence. Biologists searched remote islands where the seal was thought to have lived and interviewed fishermen about seal sightings. The interviews produced a few new accounts of seals in the Gulf, but the sightings could not be confirmed as Caribbean monk seals. Most seals seen in the Gulf in recent years are thought to be wandering hooded seals. In 1996, the International Union for the Conservation of Nature concluded that the Caribbean monk seal was extinct. 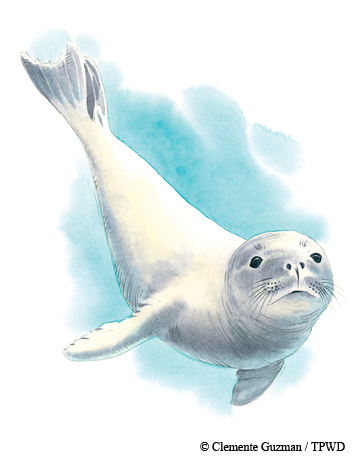 In 2008, after a five-year review, NOAA’s National Marine Fisheries Service also determined that the seal was extinct. After 50 years with no sightings, it was time to call it. The Caribbean monk seal was removed from the endangered species list. But is it really gone forever? “De-extinction” initiatives, in which scientists are trying to revive lost species, have been popping up around the globe. It’s no longer just in the realm of fantasy. Using recovered DNA, cloning techniques and surrogate mothers, teams are working on bringing back the passenger pigeon, the Australian gastric-brooding frog, even the woolly mammoth. The Caribbean monk seal is being considered for revival, along with other extinct species. We won’t be welcoming the sea wolf back to Texas waters anytime soon, but we have been getting another visitor: the sea cow, or manatee. A century ago, manatees were often observed in the Laguna Madre in South Texas, but sightings over the past 100 years have been rare. In the past few years, however, occasional manatees have been spotted near Corpus Christi and Galveston, and the Marine Mammal Stranding Network says manatee sightings have become more common in recent years in Texas.